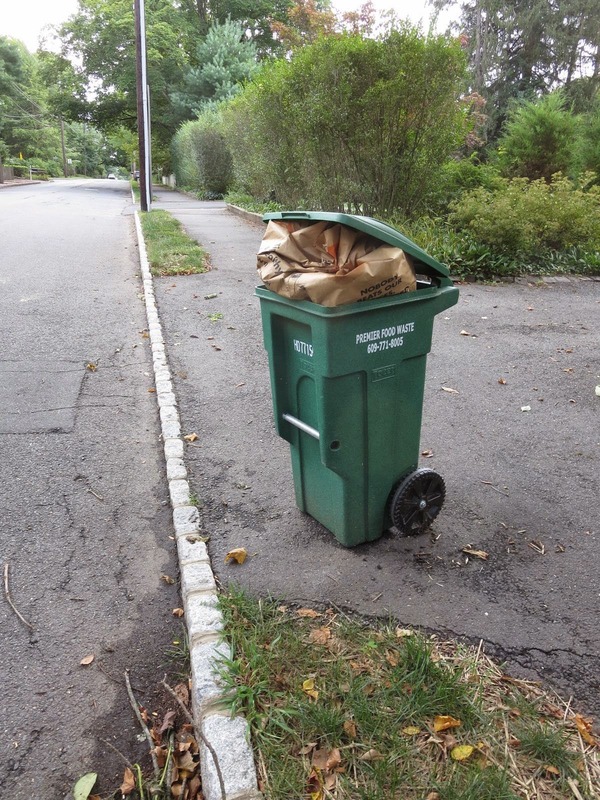 A subtle suggestion for Labor Day weekend parties: At their annual party in Harrison Street Park this past July, Princeton's Democrats were proud of how little trash got generated. 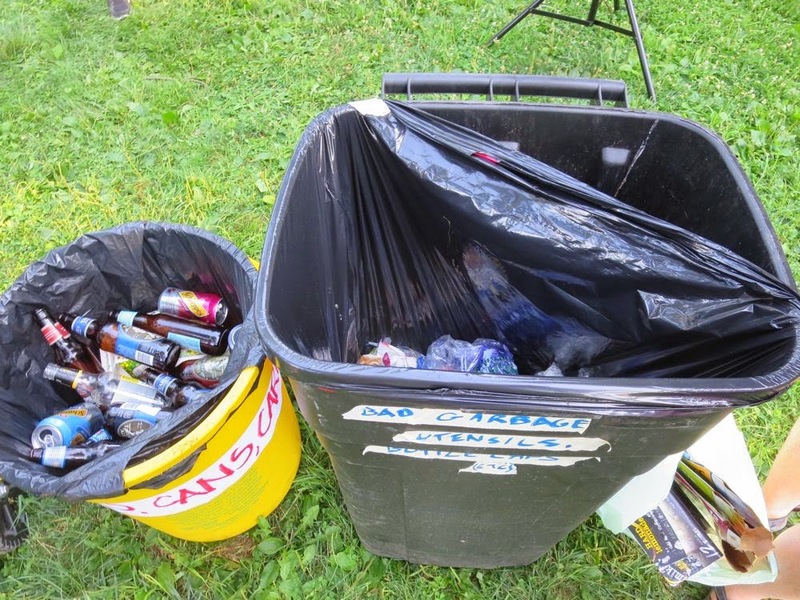 When throwing a party, it's hard to remember to be ready with the right array of bins. Paper cups, plates, napkins and food went into the green compostable bin. Bottles and cans landed in the yellow tub. That left just a scant few items like utensils to go in what they labeled the "bad garbage" can. The system worked because a few simple rules were followed: Make the various containers visually distinct, and put them side by side so that anyone with something to throw away doesn't have to walk farther to put it in the right container. 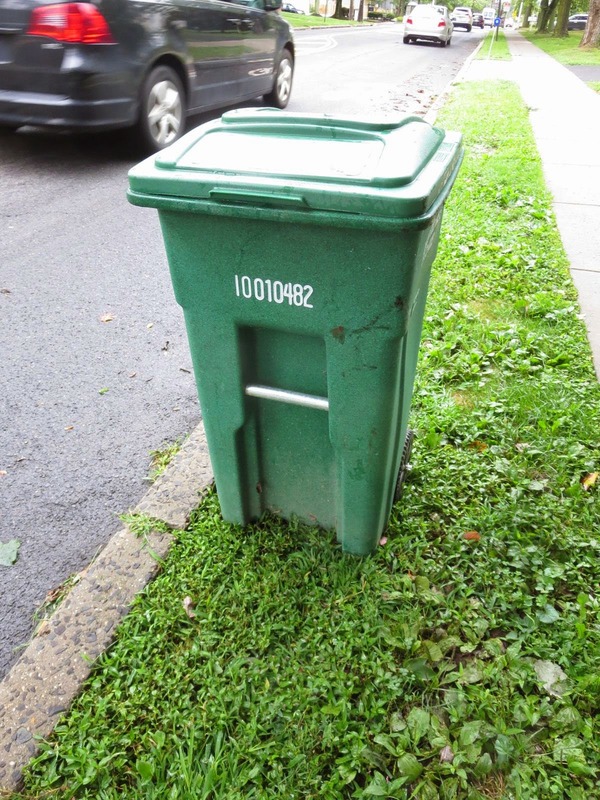 Princeton's curbside foodwaste collection uses small rollout bins. I happened to encounter one of Central Jersey's trucks making its rounds the other day. The bins are emptied by hand, without any mechanical assist. Rollout bins are widely used in other communities for trash or recyclables, and in places like San Francisco, Seattle and Ann Arbor, MI, foodwaste is combined with yardwaste in a large rollout bin as well. It's customary to give workers' backs a break by mounting a small hydraulic hook on the back of the truck. The worker rolls the bin up to the hook, which grabs the metal bar on the bin, lifts it up, gives it a shake and then eases it back down to the pavement. Princeton's foodwaste bins are small, so most have loads light enough for the worker to deal with. But foodwaste is mostly water, and can be heavy if the bin is full. Maybe that's why the worker said he'd love to have one of those hooks. I priced them out once. It costs 3-5 thousand for a retrofit. Seems a small price to pay for saving a man's back. This post continues with more photos and text at the PrincetonNatureNotes site. Look what appeared on the curb across the street the other day--a nearly new and entirely functional Canon MX 922 printer. How convenient, seeing as I had meant to head out to Route 1 two days before to buy a new one, but had gotten sidetracked. One by one, our printers had failed over the past six months. An old HP flashed some sad excuse or other on its screen. A Canon outright lied, pretending to have a paper jam when clearly no paper was jammed at all. An internet search, which usually brings up some wisdom about how to repair stuff, gave only a mocking suggestion to turn off, unplug, then plug in and turn back on, to be repeated ad nauseam. Then my wife's fancy Lexmark laser printer, nearly new, suddenly claimed it was missing a thingamajig. This, too, was a baldfaced lie--probably some sensor that had lost its sense. Support said to extract the "missing" part from the printer's innards, then put it back in. Three times I did this, turned the printer back on and, voila, the same error message. Useless printers were beginning to accumulate like dysfunctional pens that, for some reason, are so hard to give up on. In the past, before religion became so politically charged, one would call the appearance of a nearly new, functional printer on the curb a Godsend, without any implication as to one's personal beliefs. It was just part of the language. Perhaps a tenant in the rental across the street was moving out and couldn't take the printer along. Or perhaps they found an annoying glitch in the printer's performance that we have yet to notice. In any case, it was nice of them to put the printer out after the overnight rain rather than before. I'd like to think that the exasperating attempts to fix the other printers were a necessary prelude to finding the printer on the curb, that fruitless effort eventually bears fruit. Hard to prove. This would be akin to curbside Kharma, in which reward for earnest effort is oblique rather than direct. Going out in search of a printer on the curbs of Princeton would have surely gained nothing. The key to shopping at the Kurbside Kmart is to never actually go looking for anything. Call it serendipity, which works like ideas or insights bubbling up out of the unconscious mind. Its gifts always come by surprise. There's a story in this picture. Two pet peeves converged, and the result was broken glass for pedestrians to tread through on their way to and from the Princeton Shopping Center. And the municipal response? Not so great. Pet Peeve #1: Television put out for the trash. State law bans televisions from the landfill, therefor, putting them on the curb with your trash puts the garbage collectors in the position of breaking the law. What to do with them? Here's a previous post on the subject. You can also check out the town website's "What to do with.." info sheet here. Hopefully it's up to date. TVs have lots of lead and other toxics that should be recycled rather than placed in a landfill where the toxics could leach into groundwater. Pet Peeve #2: These folks put two long fluorescent light bulbs out with their trash. Some people put fluorescents out with the recyclables, which is just as bad if not worse. The fluorescent light bulbs have traces of mercury in them, which are released when the bulb breaks as it's being compacted by the garbage truck, with the trash collector standing close by. The trash collectors, who are already sacrificing their backs and their sense of smell, should not have to breathe mercury as well. What to do with the burnt out bulbs? Well, the options aren't great. Three county recycling days a year, or give Home Depot a call to ask if they still take them. So, what happened when the neighbors put out both a TV and the light bulbs at the same time? The clues are a broken fluorescent bulb and a TV taken apart. What happened here is that a scavenger driving by stopped, opened up the TV case and took the copper coil of wires to sell as scrap for a few dollars. During the struggle with the TV, he must have accidentally broken a light bulb, leaving us pedestrians--kids, the elderly, the handicapped guy with an electric cart--with broken glass and traces of mercury to dodge for X number of days. Jolly. I called the police. Law breaking had led to vandalism. What can they do? The first call yielded nothing. A second call the next day prompted an officer to stop by. He was nice enough, and spent some time on the issue, but seemed less than concerned, and was unaware that putting TVs out on the curb is illegal. I had to email him the link to the Princeton Health Department's April memo on the subject. He said it's the neighbor's responsibility to clean the sidewalk, but if no one is home when he knocks, there's nothing to be done. He kicked some glass aside. There is now less glass on the sidewalk, and one officer is somewhat better informed about the environmental laws they are being paid to enforce. Can we call this progress? There is essentially no communication with residents (or with police for that matter) to inform them of the law, and then no communication after residents break it. The glass, the law, the system--all are broken. People are starting to discover the hidden concerts in the hidden Pettoranello Gardens in Princeton. Twice a year, those of us who stay in town for the summer are rewarded by free infusions of world music put on by Blue Curtain. The second (and last) concert is this Saturday, August 2, beginning at 7pm. The concert two Saturdays ago featured Cuartetango, a New York-based string quartet that plays Argentine tangos, led by the son of a violinist who performed with famed Argentine composer Astor Piazzola. Such a pleasure to sit on the grass, music wafting across the park, cloud patterns above on a perfect summer evening. Adonis Puentes followed up with his salsa band as the sun set over nearby Mountain Lakes. The contagious rhythm and bon ami stage presence of Puentes quickly filled the outdoor dance floor. After all of these years, I've finally figured out why it's call Blue Curtain. Stage lighting made the tent for the band photogenic as well. this Saturday, with the first group performing at 7pm. Performers are Awa Sangho and Noura Mint Seymali. You can usually google the names to find youtube videos, to get a sense of their music. Here's a post about a previous performance, in which a tempestuous performance by saxophonist Oliver Lake was finally enveloped by a real tempest. Very exciting.